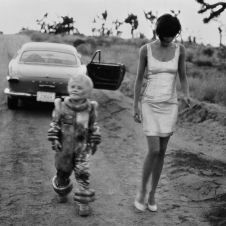 The fashion photographer Peter Lindbergh is celebrated for his artfully composed narrative photographs, as well as his films and television commercials. He began his career as a painter before taking up photography in 1971. Upon moving to Paris in 1978, Lindbergh started working for Vogue, which eventually led to assignments for The New Yorker, Vanity Fair, Rolling Stone, and Harper’s Bazaar, among others. He shoots portraits of celebrities and supermodels for these publications and has also worked on sumptuous advertising campaigns for such top fashion houses as Giorgio Armani, Donna Karan, and Comme des Garçons. Although Lindbergh works in both color and black and white, the latter is his preferred medium. “The real world is in color so if you use black and white, you take it out of the real world, out of the banal,” he once said.